City Hall Hearing a Success! Thank you all so much for all your support over the past few months. This energy culminated tuesday night in a beautiful hearing in which over 300 of you came down to City Hall to speak out or make a presence. This effort was immensely successful in demonstrating our peaceful, thoughtful yet powerful energy that was felt all throughout City Hall and beyond. 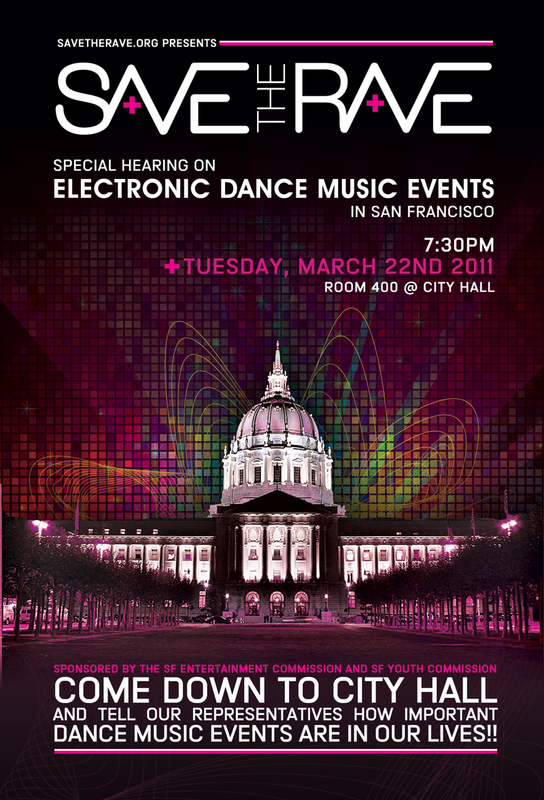 In response to the hearing, Supervisor Scott Wiener has introduced a resolution to the Board of Supervisors calling for the protection of electronic dance music events in San Francisco. He made a speech at the hearing and declared that “Shutting down events may sometimes appear to be the safest thing to do but it is NOT the best thing to do”. He said that we need to work on harm reduction and education to increase safety at events and that they are vital cultural and economic resources which need to be protected. Thank you Supervisor Wiener for your support and understanding! We will also be hosting a follow up meeting very soon and will confirm the date and location via our website, twitter, and Facebook as soon as the details are finalized. There is still work to be done and we invite any and all folks with creative energy to bring to the table to come and participate. AB74 is still on hold so for the moment and we are standing by to see what Assemblywoman Ma’s office decides to do. Undoubtedly if they bring it back in a form that still infringes on our rights we are ready to do whatever it takes to make sure that the bill does not pass! We will of course update you all the moment we hear news. 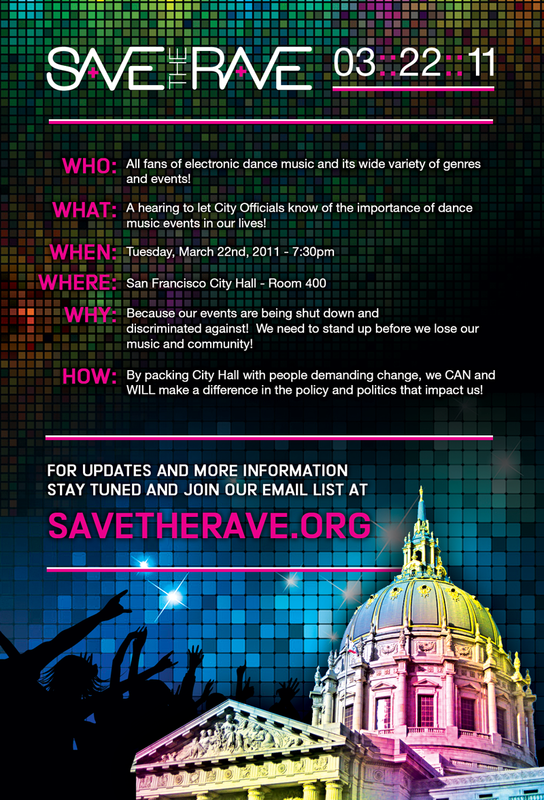 Save The Rave is hosting our next public meeting this Wednesday, March 16th at 7pm! This will be a pre-hearing strategy meeting and a chance for you to get involved in our efforts to end discrimination for electronic dance music events. This meeting will be located at 657 Harrison st in San Francisco. See you there!